I’ve come to the later half of my notebook of quotes from stories, picking excerpts for this post that are from my last year or so of reading. I’ve even almost reached the end of the physical notebook that I started writing in right before my junior year of high school. Only a few blank pages remain, and soon a collection seven years in the making will be complete. I’ll definitely be on the hunt for a book from the same company so the next edition will last just as long. Still, thinking about that girl who began the notebook and where she was in life is bittersweet. This particular post is also special because it includes an quote that sums up why I scribble down the pieces of writing that stick out to me. I love when a book perfectly explains the way I feel about something, and the list below are just a few that have really captured the phase of life I’ve experienced during the past year. While I don’t like the extremity of this thinking, this quote’s special to me because it’s a lesson I came to terms with in London. Although I ended up loving the people in my study abroad program, specifically my four flatmates, it took me time to adjust and warm up to so many new people. In the meantime, I learned that you should never rely on others to ensure a good experience — trust yourself to pull that off! I went on so many solo excursions that semester, seeking out the exact opportunities I wanted to and leaving London with a strong sense of independence I didn’t have before. Dream-casting characters in books I’ve recently read has become my favorite kind of blog post to make. It’s so funny how within just a few pages of some books, an actor’s face will permanently slap across one of the characters for me. For today’s post, I picked books that I’ve read within the last two months or so, thus these “portrayals” are still very vivid in my mind! For my previous “If These Books Were Movies” posts, check out the category’s tag! After seeing other bloggers rave about this book, I had such high hopes for it, but it fell a little flat for me. The “romance” stories I gravitate towards are usually more innocent books written by authors like Sophie Kinsella, and they have a well-rounded narrator with an entertaining personality and plenty of fun friends and family around her. This narrator was…fine. The book was just a little dull because I didn’t feel like I knew the main character Lucy very well, and it didn’t help that she lost her only close friend through work drama before the story started and her parents were only seen via Skype. However, the highlight of the book was seeing Lucy chip away at the tough exterior of her work rival and eventual love interest Joshua. Joshua is a sarcastic guy who plays tough but proves to be a caring softie when Lucy grows more attracted to him. I almost instantly saw Zachary Levi as Josh. I totally fell in love with him after watching him in the live broadcast of She Loves Me last year, and his character in that musical is similar to Josh in that he loves to rile up the people he clashes with. From what I’ve seen, Zach is a genuinely charming and friendly guy, and I think he could pull off Josh’s icy exterior and his succeeding kindness. I graduated college this year, and in the past, books I read in my English classes have often appeared on my yearly favorites list (check out my picks for 2014, 2015, and 2016). Having taken only one literature class my last semester, where I skimmed rather than read, that wasn’t the case this year. Although I ended up adoring most of the books from my college English classes (I took the majority of them with the same professor, whose reading picks I knew I usually enjoyed), I went a little lighter with my reading choices this year. As 2017 progressed, I turned to a lot of fun chick lit to clear my mind and fast-paced historical fiction to busy it. As a result, my favorites list this year is comprised of just that. It looks quite different from past years’ lists, but more importantly, I found stories that captured me, and managed to read 52 books this year as of Dec. 22! As always, a disclaimer: these are just books I read for the first time in 2017, not necessarily books that were published this year. I gushed about this book here, and it remains my favorite read of the year. 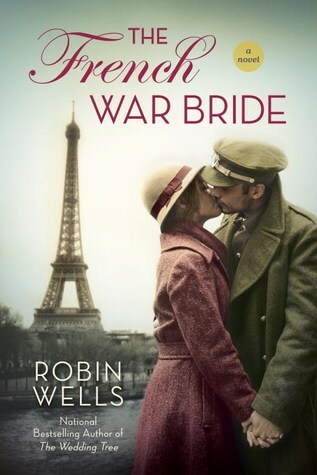 There are a ton of books set in France during World War II, and I’ve read a good number of them, but The French War Bride is the most captivating, comprehensive story about this pocket of time that I’ve ever read. It’s a long one, but it wouldn’t let go of me until I finished two days in, so it can speed by! If you’re treating yourself to a few lazy days after Christmas this year, pick it up from your library or ebook store!